Most of the time, things just work out of the box. If you have a typical home network setup, one router that connects wired and wireless devices in your home, you shouldn't have any issues. If you do find one, please refer to this page. If you can't find the answer here, please, let me know, I will try to help you. Windows 7 and Windows 10 have this already installed. If you have multiple versions of FSX (e.g. both FSX and FSX Steam), FSUIPC installer will ask which version you want to install it to. Free unregistered version is sufficient, you don't have to buy it (but it is encouraged if you wish to use advanced features). 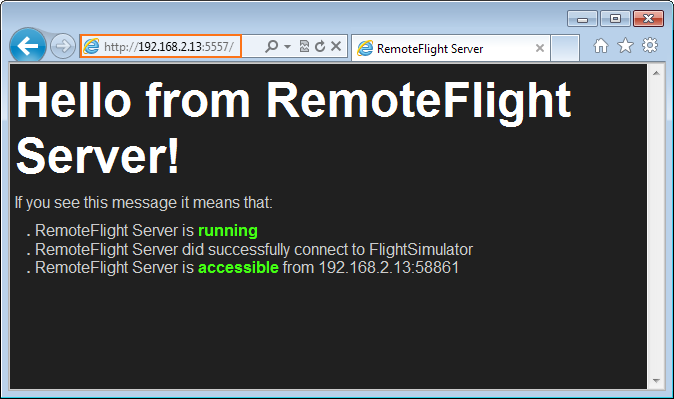 Download and install RemoteFlight Server, which is available here. Once installed, you will find the server in "Inputwish > RemoteFlight" directory in Start Menu. The application will check and download updates automatically. Download XPUIPC (development version) from the link here. Install the plugin according to its readme instructions. Start X-Plane and verify that XPUIPC item is available in Plugins menu. 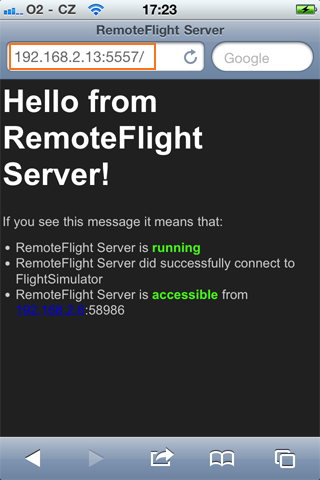 Start RemoteFlight SERVER app, and click Start server. Inside is a folder named "rfxpl"
Start Flight Simulator as you would normally and wait until it is fully loaded. Start RemoteFlight Server (on Windows Vista and 7 you will need to confirm Administrator access). On first run, the server will choose a random port, which you can randomize further or set manually. When you are happy with the port number, click the green button "Start server". On first run on Vista or Windows 7, a pop-up window will appear, requesting access to firewall if you have one enabled. Allow this exception so that RemoteFlight Server can be accessed via network. If you are using any 3rd party firewall application, make sure it allows RemoteFlight Server (please consult the manual for your firewall on how to do this). I did testing with Norton and Avast firewall, both work without problems if properly set up. Upon successful connection the status message in server window will change to "Connected to FS" and a message will appear in Flight Simulator. For most users, devices will connect to RemoteFlight Server on the first attempt. If this isn't your case, don't panic. Wi-fi networks and routers sometimes behave strange, to say the least. If that works, you can test the same thing on another device in the network - either iPhone or any other, to see if there are any problems with network, firewalls, router etc. At this point, you should be able to connect from RemoteFlight apps. However, if this step fails, you need to check your network, as the server machine isn't accessible from wi-fi devices. At certain cases, ClickOnce installation fails, resulting in state when RF Server cannot be installed or started. When this happens, you need to clear ClickOnce cache to continue. You should now be able to navigate to the folder specified above. Go to the 'Apps' directory and delete the '2.0' folder. Warning: This would delete all your ClickOnce applications. If you dig deeper inside '2.0' folder, you will find directories with all ClickOnce apps you have. Deleting only directories begining with 'remo...' will clear RemoteFlight installations, leaving other applications intact. If you feel like this is too much work to do, you can download alternative, non-installing version of RemoteFlight Server here. Note that this version does not check for updates, so remember to re-download when you buy a new app from us. In case RemoteFlight Server does crash on startup, there is possible solution. If this happens in standalone version, make sure you have unzipped the entire folder and not just an executable file. If you've unzipped everyhing correctly OR if this is a ClickOnce installed version, it's most likely to a problem with your .NET installation. In this case, go to http://www.microsoft.com/en-us/download/details.aspx?id=24872 and download Microsoft .NET Framework 4 Client Profile. Reinstall using this downloaded installer or uninstall you current .NET framework and install fresh from Microsoft .NET website.